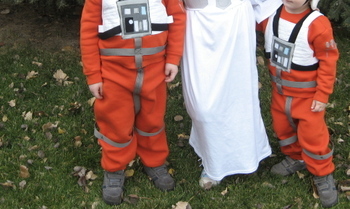 Two Rebel pilots and Princess Leia! 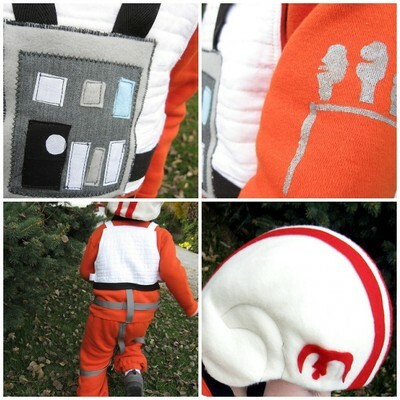 The boys' costumes started as solid orange sweats, and I added a muslin quilted 'flak vest', lots of webbing (about 8.5 yards between them), and a chest panel appliquéd from felt, suiting, and cotton. I was going to go for a more 'realistic' control panel, made with a painted box, but decided that I wanted this all in one piece. So everything (vest, straps, etc.) is sewn on to the shirt, which makes for easier dressing up and washing, since I think these will be worn a lot. The boys' costumes ended up costing about $12 each. The 'data scrolls' on the sleeves are stenciled on, and my mom helped me with the helmets/hats. Well, actually, she made the helmets (from an old pattern from 1981: Simplicity 5299) and I added the sewing details,the felt symbols, and the chin straps. The boys are thrilled, and after seeing their costumes sans hats made sure I knew they were expecting helmets.... and spaceships to ride in. My mom made the Leia costume (here she is balancing on one foot - she's doing well, a foot update soon). 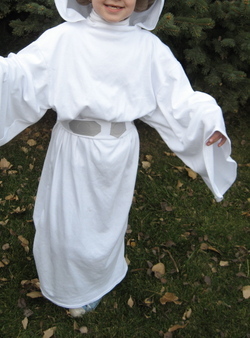 We looked everywhere for a Leia costume pattern, but didn't want to spend major $$ for it on eBay. My mom ended up using a Nativity Angel pattern (Simplicity 4797) and altering it a bit (shortening sleeves and adding a hood). Instead of adding a high neck to the pattern, she thrifted a white turtleneck to wear under. Genius, Mom! 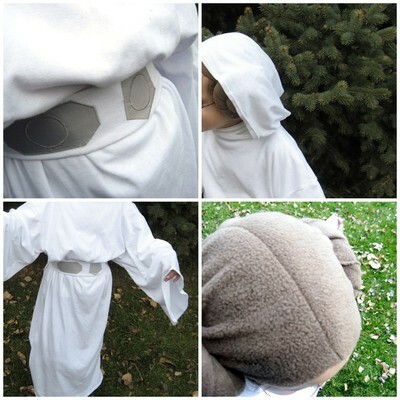 It's made out of a white knit (on sale - Mom estimates the costume cost at $6 - including the turtleneck). Inspiration for the belt came from this (there are 3 silver symbols, I guess it's on a little crooked in the photo). We made the wig/hat together. This year I wanted to incorporate hats into the kids' costumes, as it's usually COLD and sometimes snowing on Halloween night. I had a piece of fleece left over from what I used for the back of the boys' scarves (which I bought as a remnant, so it was cheap! ), and it was the perfect size. 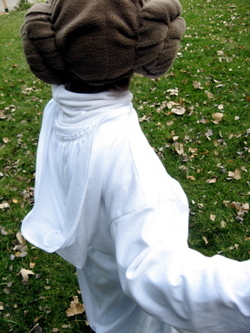 We sewed down the middle to make the part (which is lacking in most Leia wig/hats) and simply twisted up the sides. The coils are hand-stitched together. A little piece of elastic is sewn to the bottom of the back to help hold it on. It fits perfectly - the buns cover her ears like in the movie, and are in concentric circles, not sticking out like some wigs do. (And is pretty hilarious, I think).